South African opposition leader Mmusi Maimane has refused to meet Zambian dictator Edgar Lungu, in another international embarrassment. Lungu who has already arrived in South Africa summoned Maimane and Julius Malema for a meeting with him in South Africa. 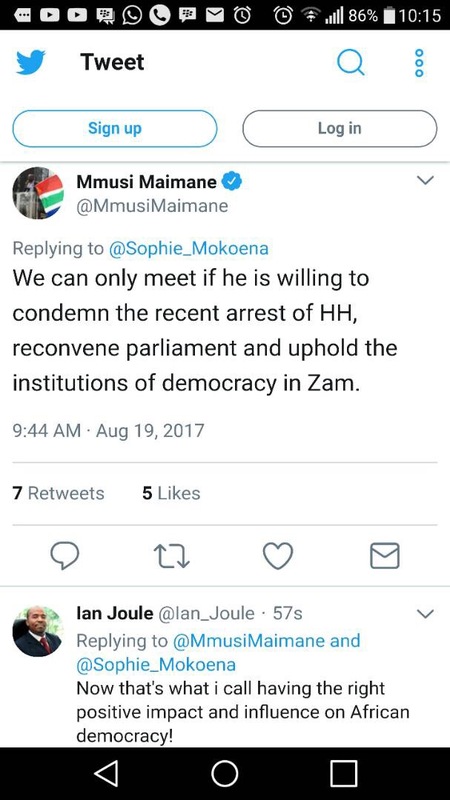 But Maimane said he can only meet Lungu if he condemns his recent barbaric arrest of Hakainde Hichilema and uphold democracy in Zambia. When we tell you that you have a charlatan for president you argue. How can you summon people in their own country when you are on a visitors’ pass? This is what happens when you hire minions as advisors and ambassadors when you, yourself you have an expired brain.